Today I sketched out my newest painting. 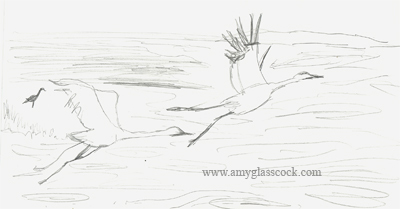 It is of some rare birds called Whooping Cranes that I saw off the Texas Coast. I will be building my stretcher for the canvas soon so it will probably take me a few days to start. Starting to work on the patterns in the water. The idea to do these patterns came from a photo that I took of the water. More work on the water patterns. I started to add some colors to the water patterns as well. I am still filling in the shapes, or for the most part making up the shapes. :) There is something beautiful about reflections of light. It's as if mankind is eternally enamored with them. Or maybe that is just me. 4.24.2011 >>> Happy Easter! He is risen!!! I worked on the light parts of the water and I changed the color of the grass. I started painting the whooping cranes today! The second whooping crane is started. More work on the second whooping crane. I added some darker areas to the green areas on the water to increase the contrast. I also painted the sky. I added some more green areas to the water and I also did some details on the birds. I added very very small cobalt blue lines around the cranes to make them appear to be closer to the viewer. I added some dark orange to the water. I also added some darker blues in the foreground. More work on the water. More work on the whooping cranes.